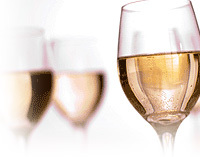 Sweet dessert wines are made from many different grapes, by overripening on the vine or drying after harvest. Any varietal from anywhere can be made sparkling, but true “champagne” only comes from France. Port is a dessert wine fortified with brandy, which makes it high in alcohol and traps the grape’s natural sugar.